Harlan Anderson just turned 80 this month. With Ken Olsen, he started Digital Equipment Corp., which was one of the pillars of the Route 128 era here in Massachusetts, and at one point was the second-biggest technology company in the world. Next month, his memoirs are out: Learn, Earn & Return: My Life as a Computer Pioneer. Oh, and he also started blogging recently. I spoke with Anderson earlier this month to ask him about becoming an author; meeting (and later parting ways with) Ken Olsen; how they raised money for the start-up; what he views as the Achilles' heel that undermined DEC; and a surprising project he was involved with that you likely have appreciated on a summer afternoon. 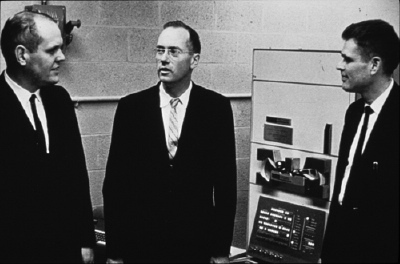 Anderson met Olsen working at MIT's Lincoln Labs in the 1950s, just as that military R&D group was being formed. "He was my first boss," Anderson says. 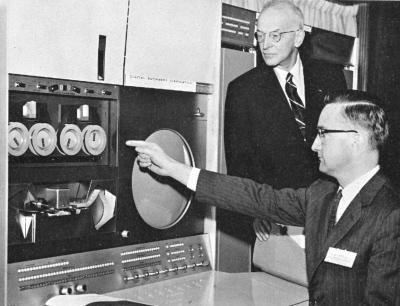 The duo wound up working together on the TX-2, an early transistor-based computer. "[Olsen] had a lot of charisma, and a practical sense of how to go about things," Anderson says. "He didn't seem like an academic who wanted to stay in the ivory tower forever." We continued to consider other sources of financing and next made a visit to the Small Business Administration office in Boston - naïvely thinking that one went in, made a proposal, and they just gave you money. That was not the way it worked, of course. However, they were very helpful in introducing us to the concept of venture capital, which was neither well-known nor widespread at the time. In fact, as far as we knew, there were only three organizations engaging in this type of financing at the time, not counting individual wealthy angels like Laurence Rockefeller: American Research and Development Corporation (ARD) in Boston and two other firms in New York. We learned that in order to present a business plan to possible sources of financing we needed to provide pro forma financial statements, which contained projected profit and loss, balance sheet and cash flow. We knew nothing about any of this. We were truly naïve in the business world, but we were eager and willing to learn. So we spent many more lunch hours at the Lexington Public Library pouring over Standard & Poor’s and Moody’s investment reference books to see what this kind of accounting information looked like for industrial corporations. I told Anderson that I'd recently been out to the mill complex in Maynard where Digital was long headquartered, and that it was still full of interesting companies. "We paid 40 cents a square foot -- annually," he recalled. "And that included heat, parking, utilities, and watchman service at night. We thought we had one heck of a deal. That was cheap, even for those days." I thought we had started a Hewlett Packard-type company with strong and lasting relationships between the founders, but instead I became a forgotten co-founder not unlike Briton Hadden, the co-founder with Henry Luce of Time. In fact, Anderson later went on to become the first-ever science advisor for Time Inc.; serve on the board of Boston-based publisher International Data Group; and to make venture capital investments of his own. At its peak, DEC employed an incredible 140,000 people worldwide. Olsen was replaced as its leader in 1992, and in the late 1990s, many Digital businesses were sold off, culminating in the sale of the company to Compaq in 1998. Part of Digital's decline, Anderson says, may have been the company's reluctance to embrace common industry standards as they emerged. "Digital was still hung up with the idea that everything had to be their own proprietary technology, whether it was software or chips." In addition to creating the first interactive computer game, time-shared use of computers and the very first computer editing program, the PDP-1’s brilliant first customers pioneered other new applications for inexpensive computers such as the first automatic switching of telecommunication lines, pattern recognition of physics particles, artificial intelligence, and other equally remarkable applications. For them, its possibilities were endless. Some have called American Research & Development's investment in DEC the "first home run" for the venture capital industry. "Was it the success of the company, or the outlandish deal they got?" Anderson asked rhetorically. "I think it was both." And if you've ever been to Tanglewood, the summer home of the Boston Symphony Orchestra, and picnicked on the lawn, you owe a debt to Anderson, who is a life trustee of the BSO. He was the leading advocate for putting up video screens on the outside of the shed, "so that people on the lawn would be able to actually see the musicians." Learn, Earn & Return is out next month. I'm hoping that Anderson, who now lives in Connecticut, will make it to Boston for at least one book event. 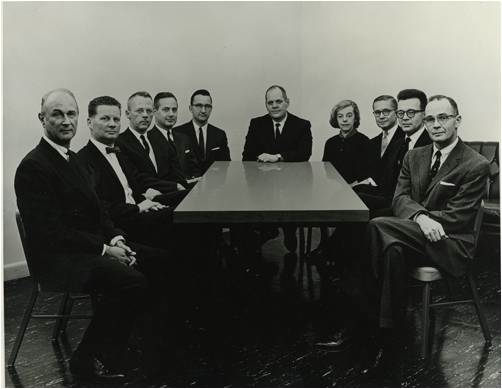 And let me end with one last great picture from DEC's past: the board of directors. Jay Forrester is third from the left. Bill Congleton from ARD is to his right. Harlan Anderson is one to the right. At the head of the table is Ken Olsen. And to Olsen's right is Dorothy Rowe. I'd not heard of her before, but she was a senior vice president at ARD, Digital's first treasurer, and perhaps the first female VC. I am a former DEC employee and I used to support Mr. Olsen's office equipment in Maynard @ The Mill. He was always congenial and quite a pleasant man to deal with. ALWAYS checked in on the common guy in the stockroom or parts depot. I miss DEC, and I am quite sure I would still be in their Field Service organization if the company was still in business. The turkeys we got at Thanksgiving and the Annual Company Outing @ Canobie Lake Park were the best! I worked at DEC from 1976-1993. At the end, the chip portion was sold to Intel, the networking products to Cabletron and the rest to Compaq. I believe the reason for DEC's decline was that the internal investment allocation was not made on the basis of the market opportunity. There were three development groups (Low End Systems, Mid Range Systems and High End Systems) at the end and much of the investment went to the High End group developing supercomputers when the market was moving to the PC's and workstations that were part of Low End Systems. I joined DEC in the middle of its downfall in 1994. I think DEC, Wang, Data General, and Prime grew as New England manufacturing companies in the computer business. As such, they had great difficulty responding to the dynamic changes in the industry and maintained a focus on hardware. If they had realized the importance of software, both open and proprietary, the companies may have had different fates. What might've have been with the Rainbow PC if it had useful software and what would've happened if Wang had made its word processor run on other systems? Working with Ken Olsen in the early 90s, I amassed a collection of oral histories from past and current Digital employees which was published as a pictoral history titled "Digital at Work: Snapshots of the First 35 Years" in 1992, just before Ken was replaced by Bob Palmer. I'd also worked with Gordon Bell as the first employee of the Computer Museum, parts of which are now at the Smithsonian, the Computer History Museum in CA, and the Science Museum in Boston. DEC was a great company in its day, but dense. Computervision fell off the cliff, and began it's long descent, in Q1 1985 (seven years before DEC's ultimate demise), for not moving fast enough to transition from its expensive proprietary hardware to open standards hardware that could support its great software. CV's president at the time (Barrett) talked the talk ("a supermarket of software solutions"), but the company, especially its tightly controlled R&D groups, didn't walk the walk. Q1 1985 was the beginning of the end of the proprietary hardware business, for all of the Route 128 minicomputer companies. You'd think that Ken Olsen and his board might have picked up on this in time to save DEC, but he was stubborn. At the same time, he was not the Lone Ranger in this failure; he had lots of good company. DEC introduced the Rainbow PC reluctantly, and never really supported it except with lip service. "Creative Destruction" ruled the day and, with more than a little sadness, techies in New England watched a generation of innovative companies fade away. ... and is possibly the pitfall of Sun Micro, too. CV got into standardization much too late. It had its warnings well before 1983, but delayed its 'port' to a Sun-based system for well over a year; subsequent feeble attempts to make it a PC-based product still floundered ten years later and it was soon absorbed by its competitor, PTC..
DEC once had a lead with its PC market with a computer called the Rainbow that used an archaic operating system. DEC had its rapid growth in an era when we all were trying to connect mainframe computers with smaller graphics-intensive systems, especially in the CAD/CAM specialty. I first became acquainted with DEC when I used a PDP-8 computer in my work at an oil exploration research company sometime between 1969 and 1973. Later, as I changed my career focus to CAD/CAM, we used several PDP 11/70's as the basis of a network to connect graphic-intensive Adage (which started in a former auto dealer's garage in Boston) and Evans and Sutherland graphics processing computers to IBM mainframes. Then, it was a 'prize' to be a member of DECUS - the DEC user group. Now that same, much more powerful technology is available with a graphics board in a PC and E&S and Adage are relics, too. It would be a very interesting career - a corporate coroner - performing corporate autopsies. So very many companies, many based within 15 miles of where I'm writing now - that have seen their demise in just the past 35 years. I'm certain there are common factors - failure to keep up with rapidly-changing technologies, having 'niche' product markets, failure to respond to customer service issues, smugness about changing markets and technologies...- that have led to their demise. It's below, posted with permission. Interviewing Harlan Anderson made for a very interesting article. DEC was already a legend when I formed my company (Cullinane Corporation) in 1968 and it brings back many memories. In my view, DEC succeeded by filling a niche which was academic computing for engineers and scientists, a market that IBM didn't serve very well. That's because IBM was really in the punch card and data processing for business market. Ken Olsen and Harlan Anderson knew their niche very well and provided a cost effective solution. That's why they succeeded. However, I have this theory that it's easier for a technology start up to enter a new market niche than it is for an existing company, with a customer base, to take advantage of this same niche. The reason is that it has a customer base that wants it to enhance the technology that they already use, not move into new markets, and leave them behind. Another important factor is that the vendor has many technicians who created the old technolgy and don't want to see its life cycle end. However, DEC re-invented itself a couple of times, (Integrated Computing and "We have it Now") so did Wang, (core memories, programmable calculators, office automation) but it's not easy to do, and eventually, it catches up with a company. 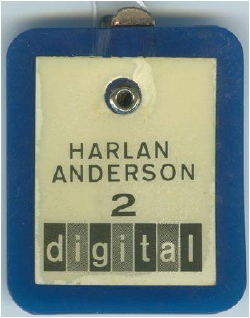 Nevertheless, it's great that Harlan Anderson has written of his personal experinces about all this history that was so important to the computer industry. He was there at the beginning. I’ll buy Harlan's memoirs when they come out. 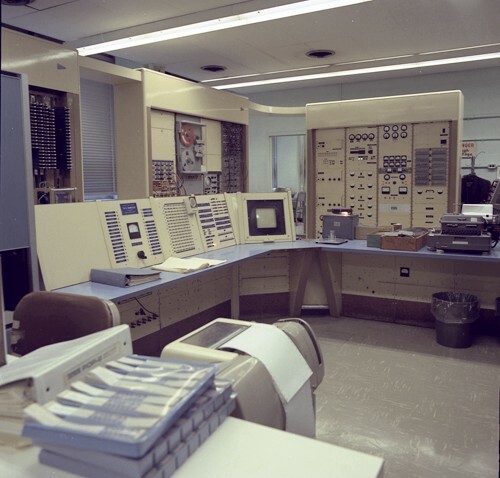 It was rumored that some students connected the TX-0 to the PDP-1 with a serial data channel, and then wrote programs that pretended to be playing chess on both machines. They then allegedly separately invited Professors Marvin Minsky and John McCarthy in to play chess, one against a program on the TX-0 and the other against the PDP-1 (unbeknownst to each other). When Minsky made a move, the PDP-1 would start flashing its lights as if computing, but would just pass the move over to the TX-0, where it would be typed out as that machine’s move. Thus, the two professors were playing chess with each other, but each thought he was playing against a computer program. Eventually, the professors realized that the “programs” on these small minicomputers were far better than any chess playing program was capable of at the time, and they realized that some trickery must be involved. At least that’s how the story goes. I probably ought to ask Minsky (who was my Ph.D. thesis advisor 39 years ago) whether this actually happened. Just one of many stories from the AI lab. Some of the best ones revolve around chess, and the later Greenblatt chess program “MAC-HAC 6”. 2. KO's general disbelief in the value of marketing and failure to name a strong VP of Marketing while allowing several marketing fiefdoms to war internally for resources with no integration. 3. Failure of senior management to recognize the developing ascendancy of application software and services at the expense of hardware in the IT industry business mix. saw where that market was headed and asked Central Engineering for SUVAX with color graphics. Engineering didn't build it and Digital lost out on the workstation market. Prior to 1983, Digital had several groups competing for resources to develop DEC's PC. The result was 3 different machines coming to the market with different operating systems and very little applications for end users. This mightily confused the sales force and we lost in the PC business. At one time, Digital had the networking technology sewed up. Sun Microsystems came along later with simple marketing messages and standards and grabbed mindshare as the networking computer company. Software Services viewed itself as a rent-a-body group supplying tech support services and missed the developing market for high-end business, process and change management services. This is the heart of IBM's Global Services business which is bigger and more profitable than their hardware business today. As a new EE grad in 1956, Ken was my Group Leader at Lincoln Lab. The group had just finished TX-0, a smallish, all transistor digital computer which was a prototype for TX-2, the first, full-blown transistorized digital computer in the world. After developing the ways of making etched circuit boards, plug-in-units and properly designed electronic circuits while building TX-0, the TX-2 effort was started. As a R&D operation LL did not want to get into anything resembling 'production' of the many bits and pieces needed for TX-2. A mutually satisfactory agreement was reached between Ken and Lincoln management for Olsen to take a group of electrical engineers who had created TX-0 out of LL and start a company that would provide the building blocks for the TX-2 project - - which took several years to construct and debug. Ken left with a guaranteed income for the TX-2 parts construction and the permission to use the same circuitry to make computer systems on his own. ARD got a gold mine and DEC was born. I heard Ken give a talk at LL in the early 1990's in which he noted that DEC had made increased profits every year since 1957! So what happened? One significant factor is the interesting case of Ken's strong moral/religious beliefs leading to unintended consequences. If Ken Olsen hired you, you had a job for life ! My son graduated from college in the mid 70's with a double major in the classics and mathematics. He applied for a job at DEC and was immediately hired as a programmer - doing 'quality control' checking of the programs needed to run DEC's computers. As such, he was flown around NE in one of DEC's helicopters to visit the many plants that DEC had and was still building. After a year, my son became restive because he didn't have enough to do, and was concerned about what he saw in many of DEC's facilities - - there were vast numbers of people sitting around clearly doing nothing ! He left DEC after a couple of years. There were rumors at LL and through old acquaintances from the early days, of top management fighting with Ken over the excessive 'deadwood' at DEC that Ken refused to fire. At about the time Ken was replaced, DEC offered a huge, generous buy-out opportunity to it's employees - - almost none of whom took it because they loved Ken and working at Digital - - . That, plus Digital's tendency to go their own way which led to a huge investment in an Integrated Circuit Fabrication Facility in Hudson, MA, - - said I.C. being unique and requiring entirely different programming from the standard, so was never taken up by the industry. These two factors led to a furious cash burn rate that broke the company . The computer company who bought it immediately cut the Digital staff from 140,000 to somewhere in the 60,000 range - - giving an indication of the unintended consequence level of Ken's high moral goodness. There was not another 'buyout' of any consequence and a lot of people were both financially and emotionally hurt by the firings. Of course, this is my view as seen from inside Lincoln Lab where I stayed for 50 years - - and as such is sketchy, but shared by others, both from Digital and LL. It would/will be interesting if someone writes a history of DEC while a bunch of 'old guys' are still interviewable - - because Digital is very representative of the great computer firms that came and went because of management/ fast technological change conditions that occurred in the last quarter of the 20th Century. I joined Digital in 1963 to open their Canadian office. I left in 1981 because I found the company's structure to be very clumsy, particularly its interface with its international operations.The product line structure was fine but the concept of each product line extending around the world - and the functions for that matter- meant that the subsidiarty managers spent all of their time packaging up problems that were to solved by someone at head ofice - not a very satisfying or productive job. I worked for DEC from 1976 to 1993 in the UK. Still the best company I ever worked for, and credit to the founders, managers and employees for a lot of what's good in the world to this day. Worked in Greenville SC as part of the 'Advanced Development Facility' '87-'93 where we developed the largest, fully gold plated most complicated circuit board ever built by any company at that time.Digital did attempt to run a world class operation at this location. My friend and Mentor, Tom Paterson worked at IBM during the 70s and early 80s. Tom gave me a letter he recieved from Ken. IBM and DEC were in negotiation over the sale of Disc Drive from IBM to DEC. After months of negotiations Ken wrote a letter thanking Tom for the opportunity and his patience. Ken wrote " Our strategy is set and our direction sure'. Tom's note to me "...apparently just wrong..."
My only knowledge of DEC was that during the 1970's and early eighties they would raid us (at Burroughs) for sales reps. For the most part, the only sales reps that they could convince to go over to DEC were those that were only 75% of quota at Burroughs; the "C" performers. The Burroughs reps who were 80% of quota (or higher) made much more money staying at Burroughs. I often wondered what the impact was on Digital of having taken so many under performing sales reps.
You can read all 16 archived comments over here.